Orbetello is a lovely village in the south of Tuscany, more precisely in the middle of one of the most beautiful corners of Maremma. 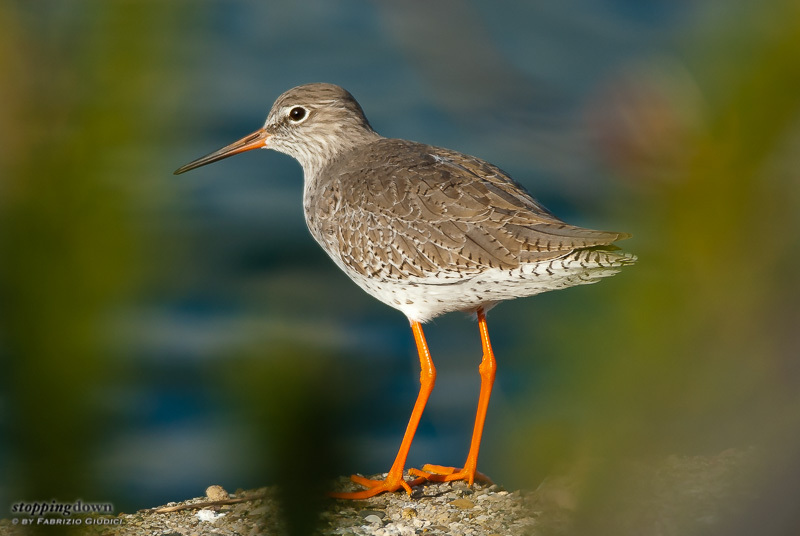 It has been built on a small peninsula at the centre of a lagoon and the abundance of water makes the whole area one of the most important hot spots for observing birds in Italy. For sure it's one of my very favourite ones. 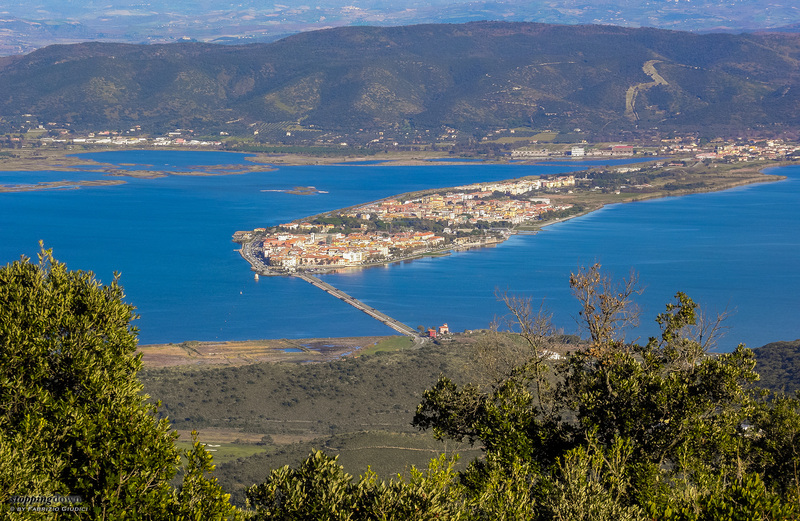 The village of Orbetello seen from Monte Argentario. Olympus SP-590 UZ + @ 22 mm, 1/250 sec @ ƒ/5.6, ISO 64, hand-held. 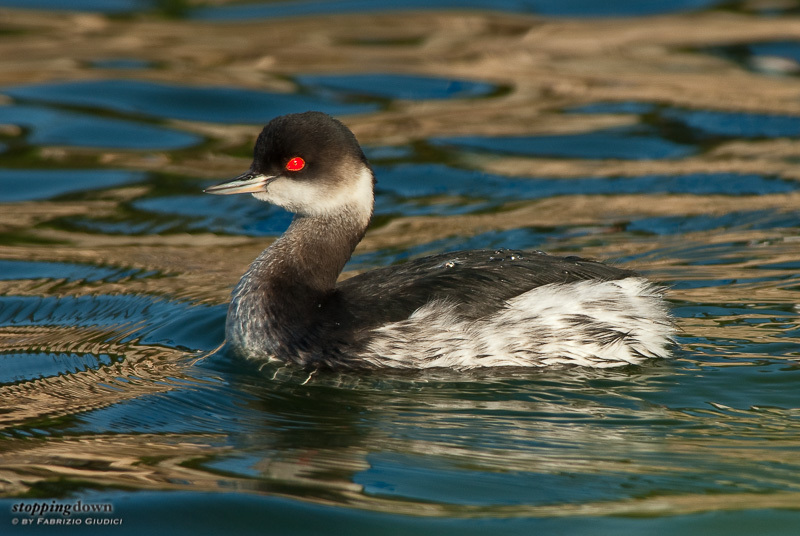 While Orbetello is well known among birders for a WWF wildlife sanctuary, located a few kilometres north of the village, it happens that the village itself is a birding hot spot. With a bit of caution, I can get close to birds and enjoy photo opportunities - sometimes even better than those in the sanctuary, also considered that I am not constrained to operate from a wooden observatory. I say that Orbetello is a nature photographic set and to demonstrate how rich the experience can be there I'm illustrating this two-folded post exclusively with photos taken in no more that four hours of operations during two consecutive afternoons. One of the first things to watch for is the air traffic. The Orbetello peninsula and a man-made dam split the lagoon in two separate parts (the Western and the Eastern Lagoon). 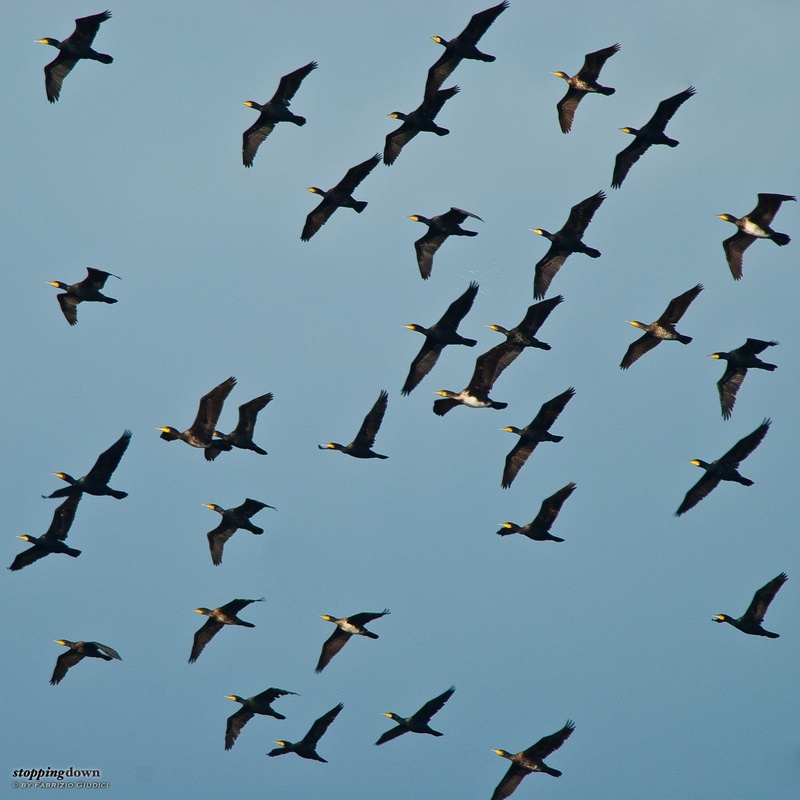 Sometimes large flocks of birds decide to move from a lagoon to another with spectacular flights, often just above the village. As usual, birds are unpredictable and I must be prepared for ongoing action at every moment. Often I don't have the time to set up the tripod, so I rely on a fast shutter time to avoid motion blur, using continuous autofocus to track the flight. 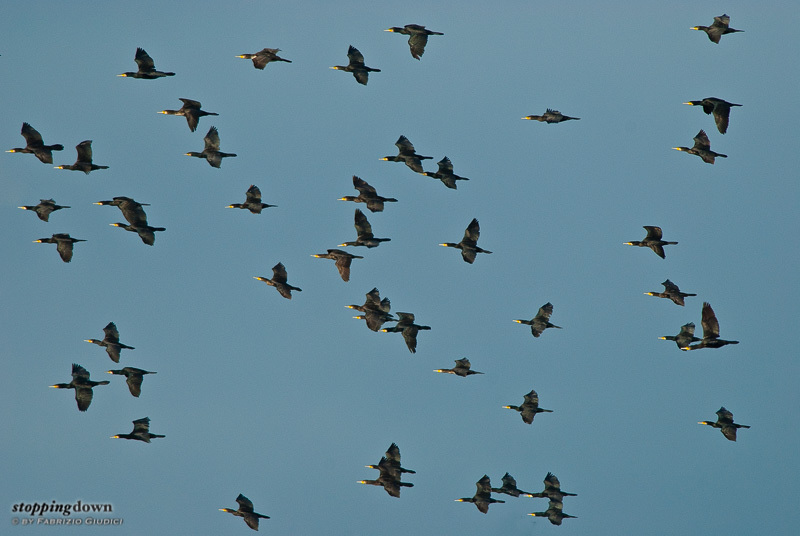 For instance, yesterday this large flock of cormorants came out behind my back while I was watching the lagoon with the binocular in a completely different direction. Nikon D200 + Nikkor 300mm ƒ/4D ED-IF AF-S @ 500 mm, 1/500 sec @ ƒ/8, ISO 220, hand-held. Other times I have to be a bit lucky. 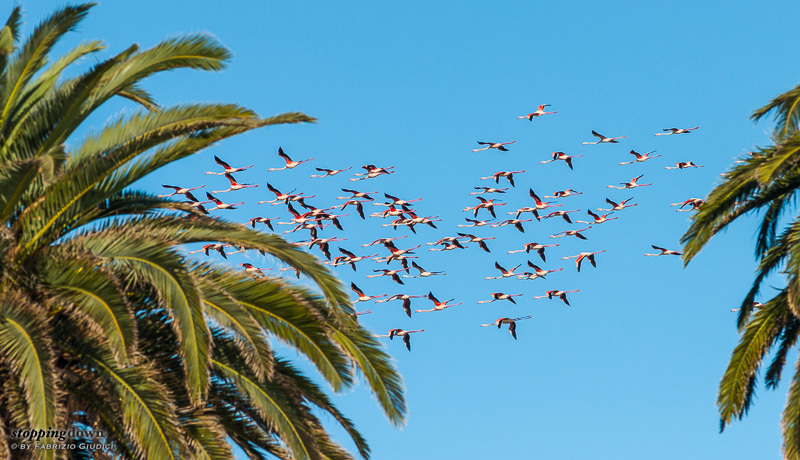 Today I caught a flock of flamingoes flying over the village while I was having a short break for eating a sandwich. Coming from a morning session about landscapes, I had a wide-angle mounted on the D200 and an AF 180 f/2.8N mounted on the D5000 - that can't autofocus with that lens. I had to resort to manual focusing, stopping down to f/8 to increase the DOF. I've been able to catch the flock in the middle of two palms, which is an unusual perspective - furthermore, the palms are nicely blurred, conveying the eye to the sharply focused birds. Had I used the D200, trying the autofocus, I would probably have missed the shot, locking the focus on the trees instead of the birds - or, worse, hunting without even getting a lock. A flock of flamingoes over the village palms. Nikon D5000 + Nikkor 180mm ƒ/2.8N ED-IF AF @ 180 mm, 1/500 sec @ ƒ/8, +0.33 EV, ISO 400, manual focus, hand-held. After the flamingoes went away, I resumed my sandwich - but not before mounting again the AF-S 300 and the teleconverter on the D200, to be prepared for any new surprise. The car was parked in a facility at the border of the lagoon and several birds, including some cormorants, were swimming and fishing at various distances. 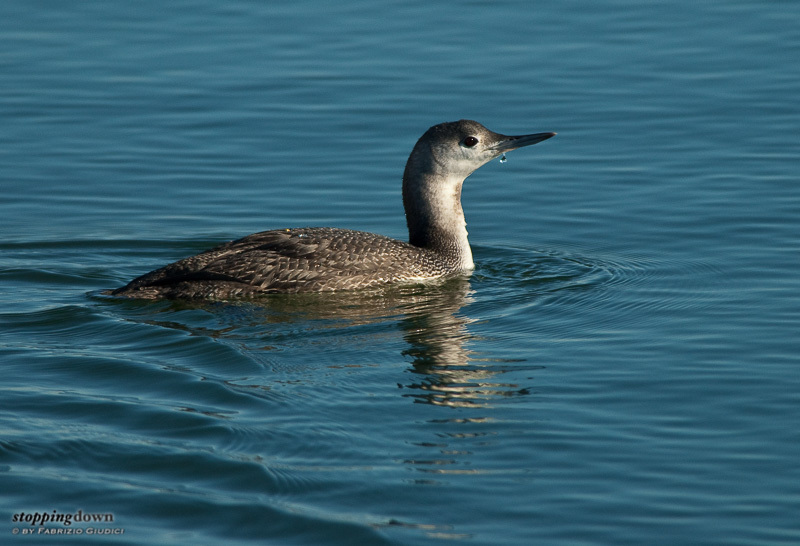 A “strange” cormorant caught my attention and turned out to be a red-throated loon. In just a couple of diving sessions it got closer and entered in range for a shot. Luckily I had earlier prepared the long lens! By the way, it was my first loon ever. Nikon D200 + Nikkor 300mm ƒ/4D ED-IF AF-S @ 500 mm, 1/800 sec @ ƒ/8, -0.67 EV, ISO 280, hand-held. The photos could have been better if I had lowered down of the ground, but I had stuck the sandwich in my mouth and didn't feel very comfortable. 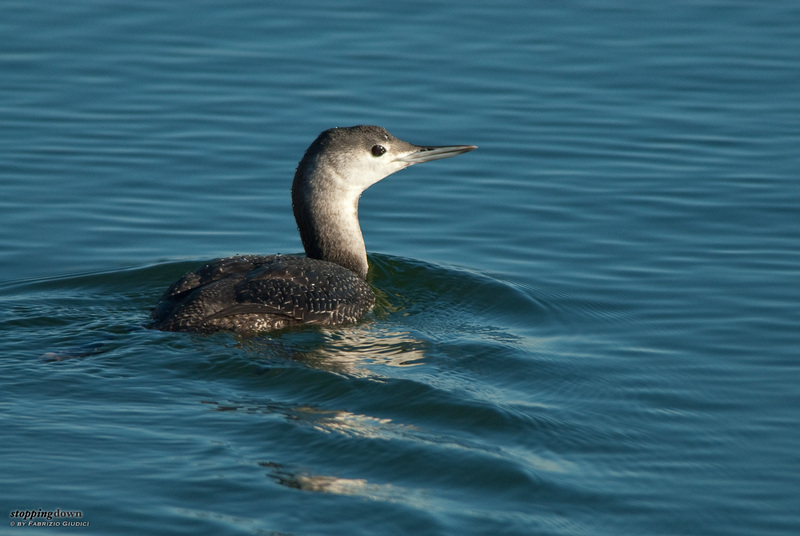 After a few seconds I grabbed the tripod trying a better perspective, but in the meantime the loon had swum to an area in full sun backlight and soon after it gained a considerable distance. In Orbetello things aren't always rushingly. Yesterday, roughly at the same hour, I was eating a sandwich on the opposite parking lot, the one facing the Western Lagoon. I was watching the water surface, since often wading birds fly a few centimetres over it and land at the border of the area, to have a rest or to eventually hunt. They feel comfortable even when there's people walking around, as there is a strip a few meters wide filled with grass and bushes, separated from the parking lot by a fence. Often it is not possible to use the tripod, as it prevents from getting the right perspective through the bushes, but I usually get good results stabilizing the lens with a small beanbag laid on the fence. After a few minutes I spotted a common redshank. 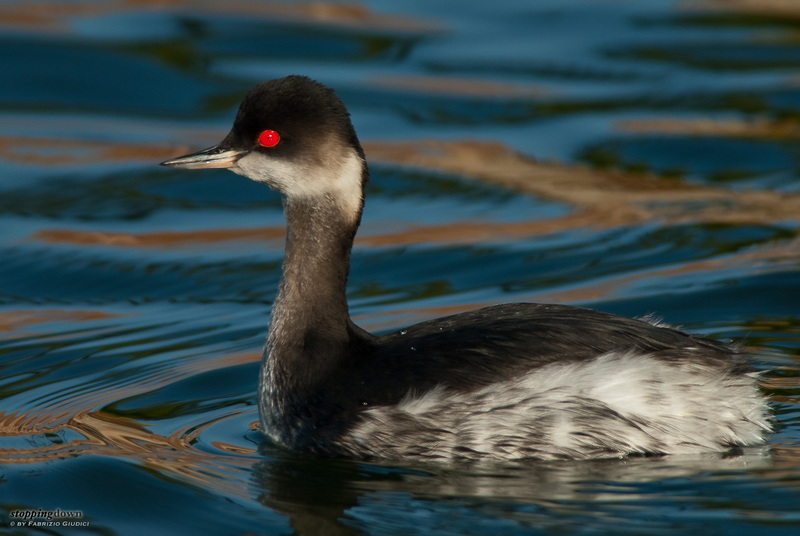 I took my camera and moved closer, but all of a sudden I heard a loud whistle: it was the voice of a black-necked grebe. It was easy to find it, swimming against the flow in a small channel that connects the two lagoons. It was near, slowly moving because of the water flow and not worried at all by my presence. I first got a sequence of hand held shots, then I realized I had the opportunity of getting to the ground for a better perspective. On that purpose I used the Kirk Enterprises Window Mount - while it has been designed for operating from inside the car, it has some extensible feet that make it suitable as a very low-on-the-ground support, especially on concrete floors. I also used a shutter release cable for better stability. Nikon D200 + Nikkor 300mm ƒ/4D ED-IF AF-S @ 500 mm, 1/640 sec @ ƒ/7.1, -0.67 EV, ISO 140, Kirk Enterprises Window Mount and shutter release cable. Nikon D200 + Nikkor 300mm ƒ/4D ED-IF AF-S @ 500 mm, 1/640 sec @ ƒ/7.1, -0.67 EV, ISO 160, Kirk Enterprises Window Mount and shutter release cable. Nikon D200 + Nikkor 300mm ƒ/4D ED-IF AF-S @ 500 mm, 1/400 sec @ ƒ/9, -0.67 EV, ISO 160, Kirk Enterprises Window Mount and shutter release cable. 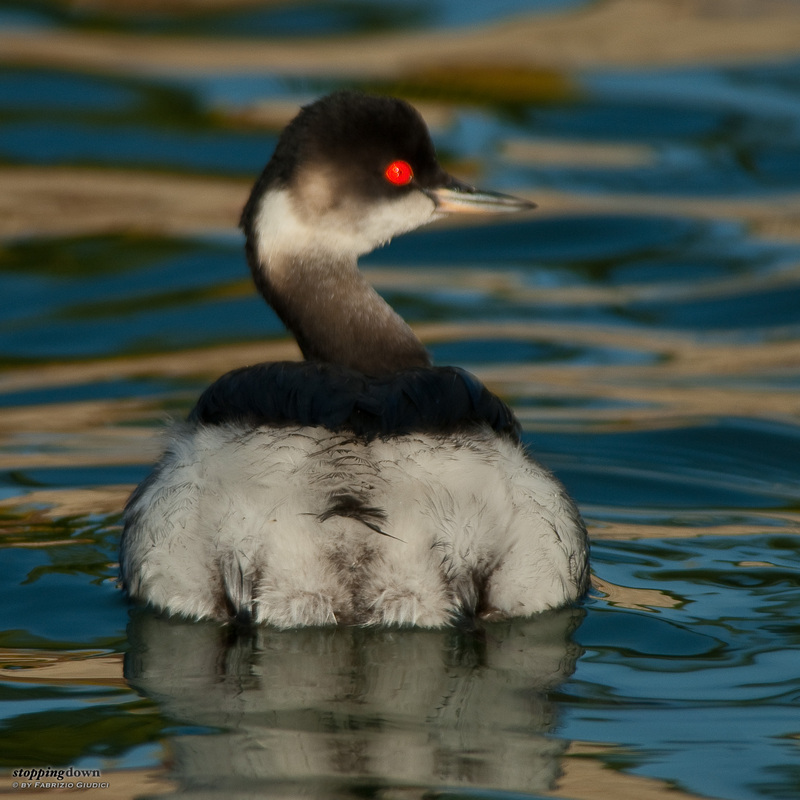 Since the bird was relatively slow in swimming, for the latest shots I traded some shutter speed for a narrower aperture, gaining some DOF; you never have enough with these birds - and, in fact, in the middle shot the head is slightly out of focus (I focused on the tail soft plumage). 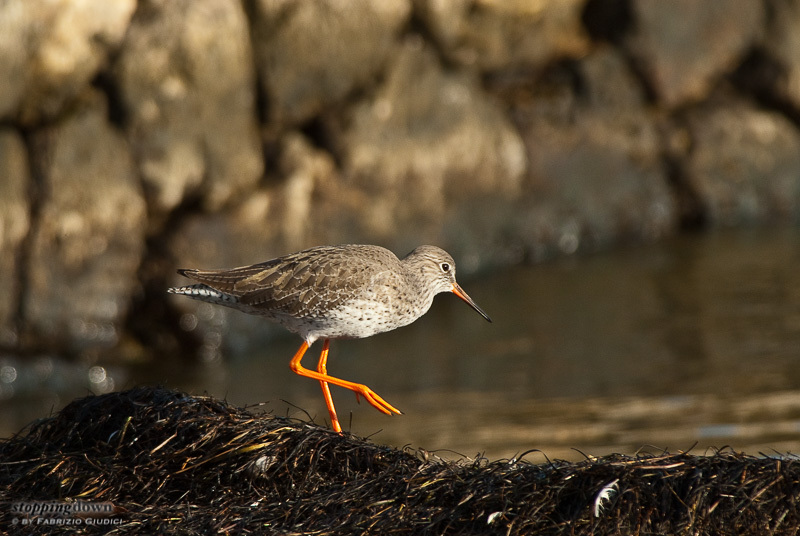 Then I moved to the redshank. It was still there, viewable through a small hole in the vegetation. This usually turns out into a partially hidden subject with a pleasant “blurred curtain” effect that I like a lot, but it's a challenging focusing scenario. To avoid troubles with the autofocus, I enabled the AF-Lock button of my Nikon: it decouples the autofocus from the trigger, allowing me to aim at the subject through an unobstructed view, focus, recompose and then shoot multiple times without engaging the autofocus again. 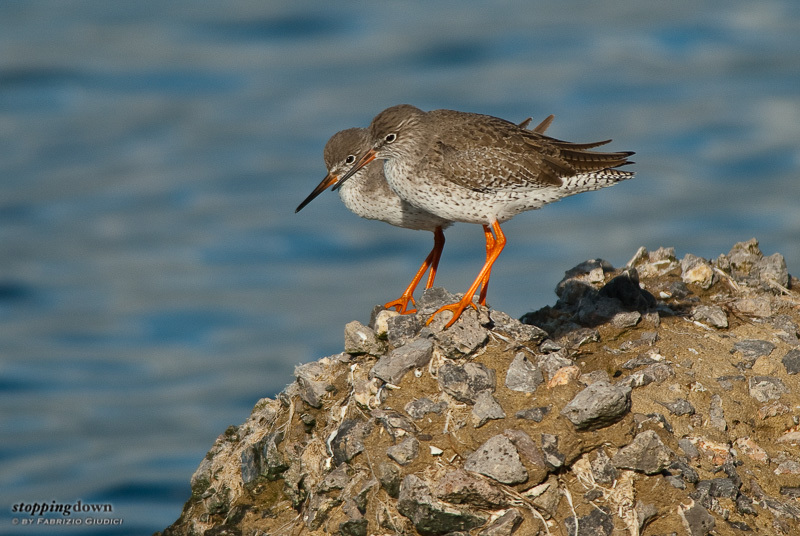 It turned out to be one of my best shots of a common redshank. 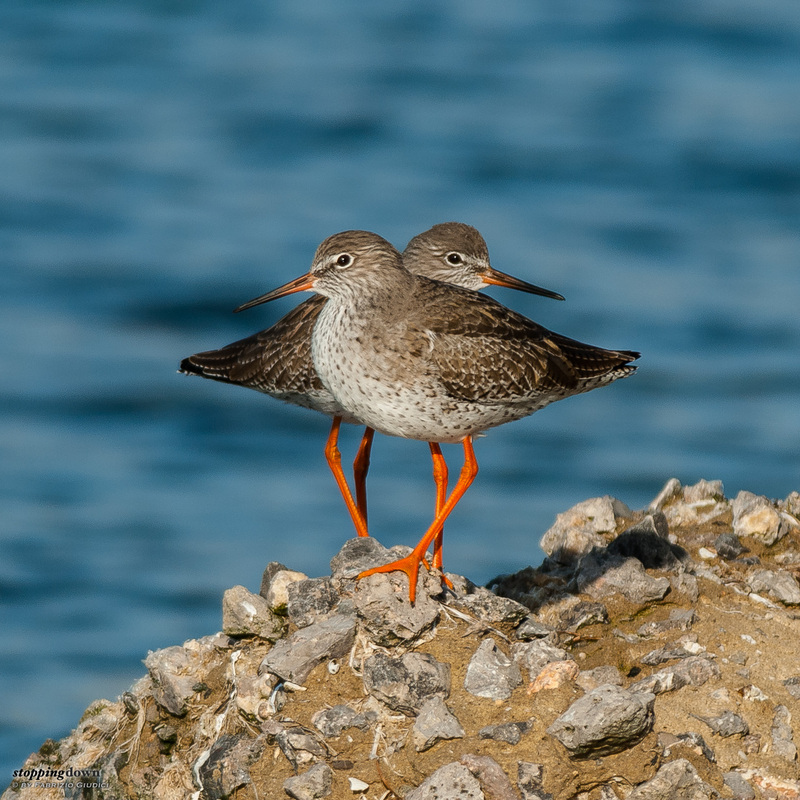 A few minutes later I was again in my car, when I noticed some further action: a second redshank was flying from the lagoon and joined the first one; and the pair had moved to a different point. They played the musical statues for a while, giving me plenty of funny opportunity shots. Minutes later, yet another redshank made for another interesting subject, in a completely different light (this time I was able to comfortably operate from inside my car).